Inside the wardrobe are two hanging rails, in the right hand section. The section on the left is shelves only. 2 DOOR CORNER WARDROBE. ONE SIDE IS SHELVING, ONE SIDE IS HANGING SPACE WITH 2 RAILS. Crafted from high quality and carefully chosen oak, this stunning Grosvenor range of furniture is sure to go unnoticed. Can be mixed and matched with the rest of our Grosvenor range. Finally, there is also a White Glove service available. The Charles range has an attractive oak veneer finish with a contrasting walnut trim situated just below the top panel. PLASTIC VENEER. DRAWER SPACE W680 D365 H130. This Item is part of a complete bedroom range comprising various chest of drawers, dressing table and wardrobes. Ash Black Wood Effect Carcass. 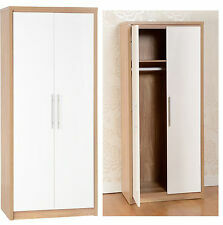 Item Type: 2 Door Combi Wardrobe. 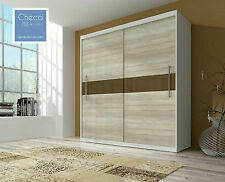 Marina Modern High Quality Gloss Bedroom Furniture Units: Wardrobe Only. Robe Features: 2x Hanging rails for either side, 2 drawers. This wardrobe will undoubtedly make any bedroom stand out. Osaka 135cm Wardrobe Complete. 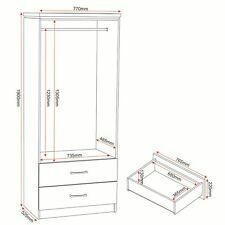 135cm W x 199cm H x 58cm D. 3 Doors Mirrors and Drawers. Oak Finish - sample available. Bedroom Living Room Beds Dining Room Any Room. Quality German Build. Here at Robinsons Furniture LTD, we are happy to help! Solid Oak Triple Wardrobe Excellent Condition dark brown. Condition is Used. collect in person 10 mins drive from manchester airport, buyer to dismantle if needs be dependant on size of transportation. 3 years old, bought from oak furnitureland, selling due to house move, moved by professional removal company who have reassembled, but put doors on wrong way (see pic) this does not affect use to wardrobe and can be changed again once in situ. Cost over £800 3 years ago so huge bargain. 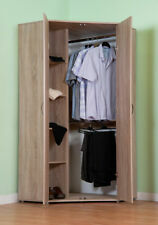 Modern, sleek wardrobe with 2 sliding doors. Matches the Vereno White bedroom cabinet range. Modern white finish. Overall height: 197.0 cm / 77.6 in. GOOD QUALITY, GREAT VALUE, GUARANTEED CHEAPEST ON EBAY! Solid Oak & Hardwood Construction. Colour Matched to F&B DOWNPIPE GREY. This is a lovely solid Oak wardrobe with hanging rail. Not only the visible sides but also the back and hanging rail are solid oak. Easy to take apart and reassemble, (the sides have long hinges attaching them to the front so the wardrobe will remain square when reassembled) but as you would expect pretty heavy. 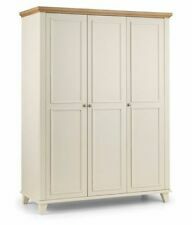 New listingStylish Oak Wardrobes Unused - too Large for Cottage Bought new at 650 - 2 No. 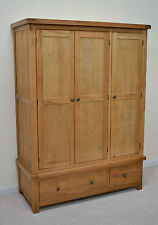 Stylish Oak Wardrobes Unused - too Large for Cottage Bought new at 650 - 2 No.. Collection in person only. IKEA of Sweden. 1 clothes rail and 3 adjustable shelves included. Adjustable hinges ensure that the doors hang straight. Good to know. TIPPING HAZARD – Unanchored furniture can tip over. This furniture shall be anchored to the wall with the enclosed safety fitting to prevent it from tipping over. This is a beautiful high quality solid oak wardrobe with two large doors, steal handles, and a hanging rail inside. The wardrobe has been well looked after with minor marks consistent with age and use. Wardrobe "Westa 4" Colours available: Black Dimensions: W: 150 cm H: 200 cm D: 58 cm Production: High-quality laminated board resistant to scratches and humidity with PVC edges. Fronts are made of MDF. The furniture is made of 16 mm thick matt laminated board. Additional information: The furniture is brand new, packed in the original packaging. The furniture is delivered in boxes, ready for self-assembly. The set includes a clear assembly instruction and all necessary elements. 24 month warranty. Professional assembly service for 80 £. Solid Oak Gents Wardrobe With Two Drawers. Condition is Used. Collection in person only. PLASTIC VENEER. PAPER VENEER. MDF DRAWER BASE. DRAWER SPACE W680 D365 H130. DRAWER FRONT W765 H220. MDF BACK PANEL. GLASS DOOR SIZE W380 H1315. DOOR SIZE W380 H1760. 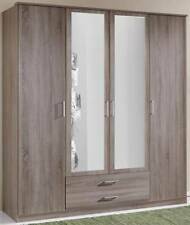 The Seattle 2 Door Sliding Wardrobe features a contemporary design with a light oak effect finish with a textured 3D surface and quality white contrast door panels. Hat shelves can be positioned at the top or the bottom of the wardrobe. 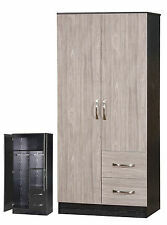 New Malibu 3 Door 4 Drawer Wardrobe - Oak Effect Description ------Size H180.5, W110.35, D49.8cm. ------Weight 69kg. ------Made of wood effect. ------1 hanging rail. ------4 shelves. ------4 drawers with metal runners. ------Internal drawer H12, W47.8, D43.6cm. ------Metal handles. ------Handle size: L2.2, W2.2cm. ------Self-assembly - 2 people recommended. ------FSC certified wood. Delivery Please note that we deliver to UK Mainland addresses only and it excludes Highlands, Islands and Northern Ireland if in doubt please email before purchasing as additional charges may apply. We do not ship to the following postcodes: IV, HS, KA27-28, KW, PA20-49, PA60-78, PH17-26, PH4-44, PH49-50, ZE, BT, IM, TR21-25, JE, GY, AB31-56, Orders received Monday to Friday before 12pm will usually be dispatched same day. Charles White 3 Door 2 Drawer Mirrored Wardrobe. Available in oak or white veneer the Charles range represents great value for money without compromising on style or quality. Try to use the product only for it's intended purpose.